How could I refuse? “Yes, you get the boat ready.” I replied. I finished my work and met her on the dock. I remembered the things she had forgotten – life jackets and a camera. We catch and release, but photo first – when we can. 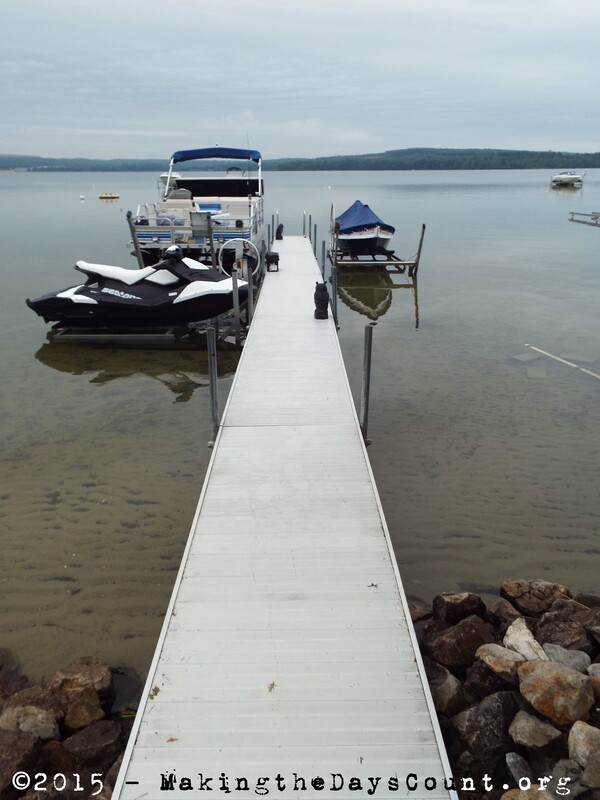 still waters beneath my feet…..
We pushed off the dock and were on our adventure. I let O pilot the pontoon to our favorite fishing spot, she knew where she wanted to go – across the lake just off the Big Bear Point. O had decided to try fake worms, but had brought real worms as a backup. She cast her line and waited, and waited, and waited. No bites, we kept looking down, beneath the surface, we could see the bottom and he weeds, but no fish. 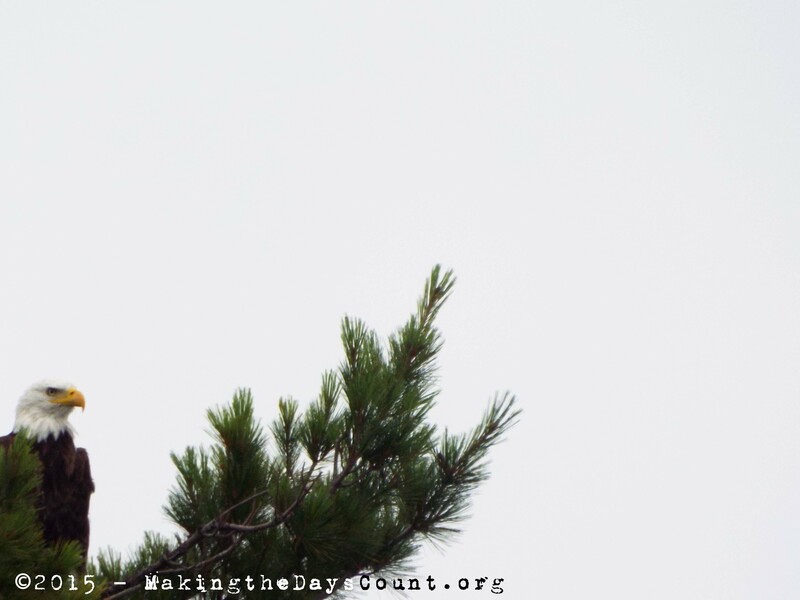 Discouraged, we cast our eyes to the sky and we saw an eagle. The eagle flew across the lake and back and landed at the top of a pine looking down into the water with much the same mission as we had – fish. Though, I doubt the eagle had any thoughts of catch and release. I let O have the camera and she came up with the shot below. We pulled anchor and headed off to another spot hoping for better luck, but instead saw the eagle flying along the shore searching for fish. We followed. 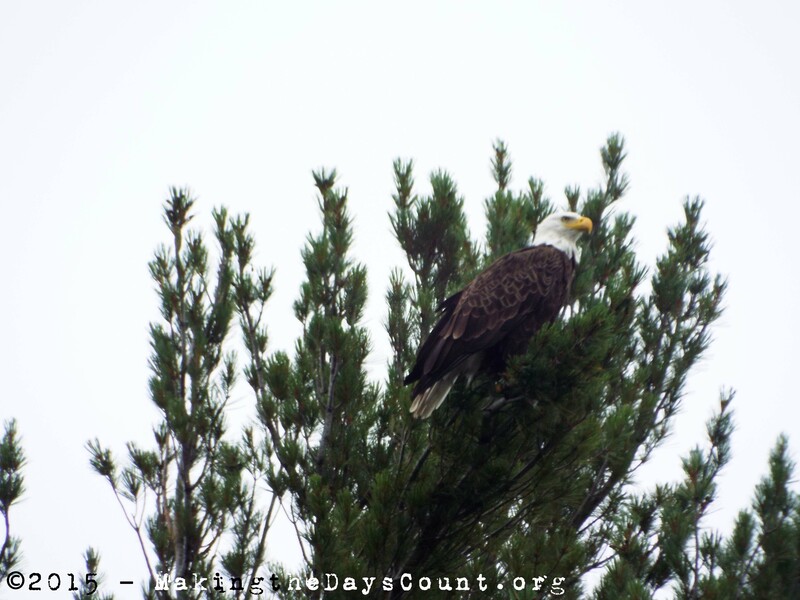 the eagle flew along the shoreline searching…. We tried our luck with the camera and the fishing pole; though, we had our best luck with the camera. O tired of eagle watching and we returned to our original spot and our fishing luck improved, due largely in part to a bait switch. 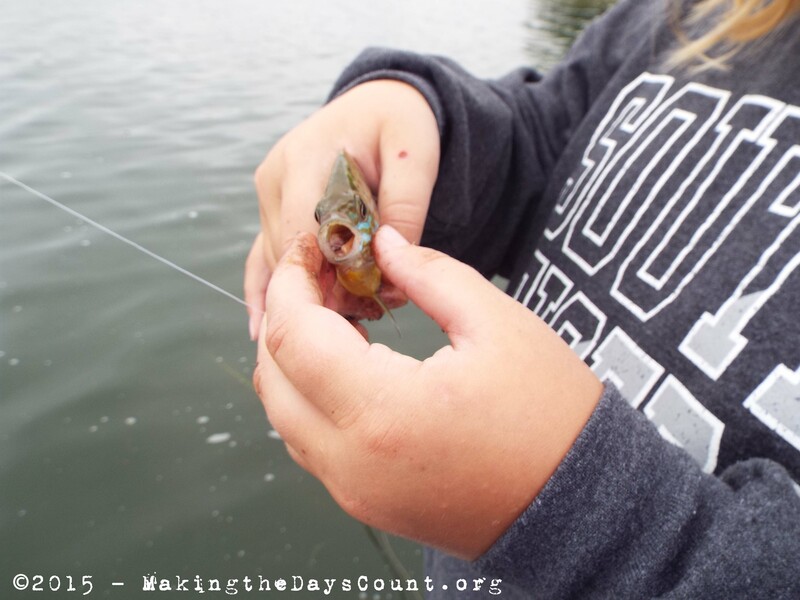 By the time we had finished, we had pulled almost a dozen perch, sunfish, and blue gill in and released them back to the waters beneath us. It was a great time. It was our last Saturday at the lake for the summer. That was yesterday, it’s Sunday morning and all is quiet. The kids were down the lake last night at a campfire and they came in around midnight. I waited up and went to sleep after they came in. It is a special here at the lake, a place for us to remain grounded by what lays beneath our feet, often unseen, under appreciated. There is beauty in what lays beneath us, and all around us. Yesterday was an amazing day. O and I fished, I got a few chores done, we got one boat out, and we spent the late afternoon on the lake, docking the boat as the sun came down. We made it to the ice cream shop with only minutes to spare laughing and giggling about the day. Today is going to be a great day, even when I am putting boats away, deck furniture, and packing the cottage for the next season. I’ll be making a list of what I need to do when we come back. Making the Days Count, one day a time, looking down – beneath my feet, looking up above my head, but above all – looking. When was the last time you looked down and saw what lay beneath your feet? 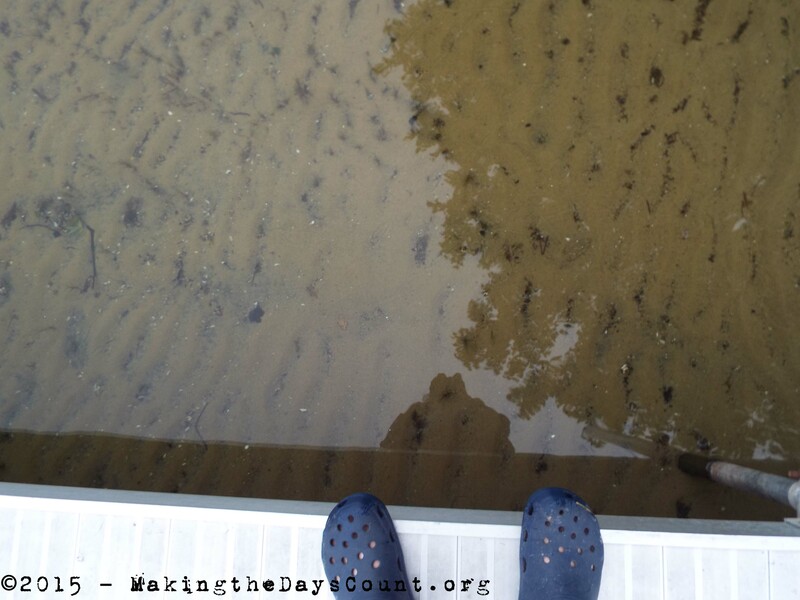 Today’s post is inspired by O, and Word Press’s Weekly Photo Challenge – Beneath Your Feet. Each Friday, we ask you to look through your lens in a different way. In the past, we’ve challenged you to get close. Gaze up. Peek out the window. Today, look down and document the world beneath your feet. Experiment with your angle: stand as you snap your picture, or get close to the floor. You don’t need to include your feet, as I’ve done in the photo above. Consider all kinds of settings and surfaces, from interesting textures and patterns to sidewalk or exhibition art. Think about the details you will include (and leave out) in your frame, too. Great post Clay. I love the photos and the idea of spending some quality time with your daughter. That’s what life is all about. We had a wonderful fishing trip, thanks – we’re home now. I am sad, but life moves ahead, whether I am ready or not. Mom is still at the lake and I have O’s haircut and school supplies list to cover before she gets home – and her school photo – I had better not screw it up! We’ll have some awesome time together the next few days. W started football at 6:30, sharp. It’s gonna be a great day – have a great week. That’s an eagle all right! Nice shot. Thank you – I had seen a pair land by the lake several years back, but hadn’t seen one since – I suppose you have to look and be at the right place at the right time. She was very proud of her work – and the post, surprisingly. She usually says, “daaaaaadddd, did you write about me, agaaaaiiiiinnn?” And does the eye-roll thing, like she’s embarrassed, but deep down I think she’s pleased. Have a wonderful week. Well done O. Fantastic shot of the eagle. Beats a shot of a fish, I’m sure. I showed O your comment and the post – she beamed. 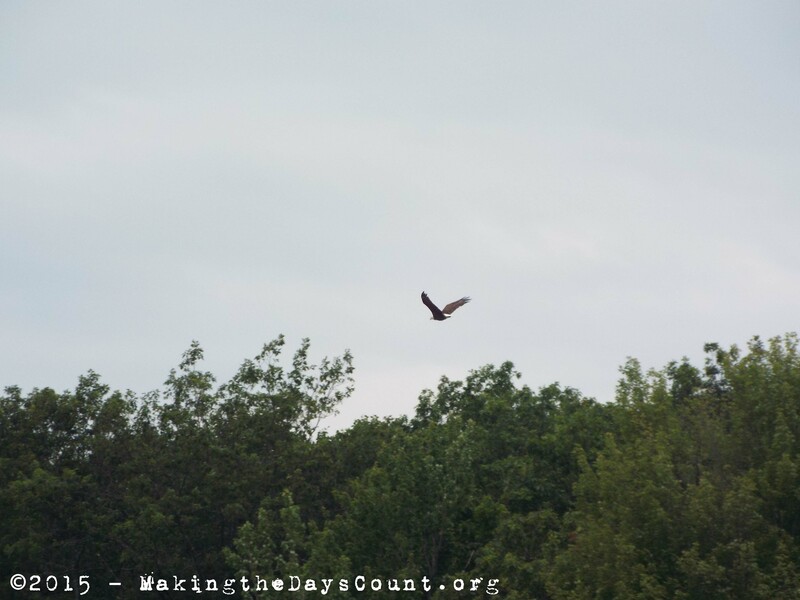 She caught several fish and she said she saw the eagle on Sunday morning when she was on the lake. We’re home now, drove home (late) last night and we’re getting ready for school to begin next week – she start classes Wednesday and I start back Monday. All good things must come to an end. Thanks for stopping in – have a wonderful week.